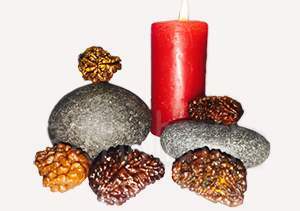 One Mukhi Rudraksha is ascribed to Lord Shiva (Param Pita Parmeshwer). 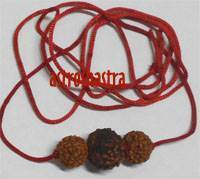 The use of this Rudraksh around the neck or on the arms in gold or silver, blesses the wearer with power, authority, wealth and all comforts of life. It is excellent for doctors and politicians. Its worship ensures Bhakti, Mukti and peace of mind; abundance of wealth and all troubles of his entire family vanish. It bestows Sarva Siddhi and Moksha. 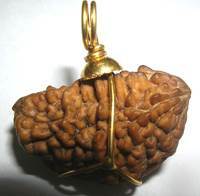 This is the auspicious and sacred Rudraksh and can be flat or Oval (Indonesian) or Moon shaped (Indian Origin). It is considered as one of the most auspicious bead as it bestows wealth and happiness. 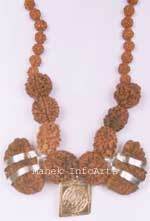 It represents true form of Lord Shiva and wearer gets bhakti, mukhi and peace. Sun being the planetary lord of this bead, which in astrology signifies father, courage, power, vitality, personality authority, consciousness, sattvic nature and wearer of this bead gets benefit from all these aspects. It is also belived that wearer of it would get rid of the sin of brahm hatya and would get salvation. 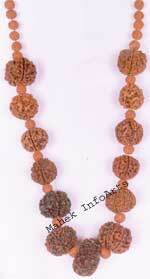 It bring you immense power, wealth, luxuries, fame, massive confidence boost and spiritual enrichment. This bead often carries an auspicious sign of signifying a connection with Lord Shiva. It is found in two shapes round and the half moon shape. Round shape is highly praised in our ancients texts but it is very rare and more of a myth . Half moon is easily available and found in a family tree from India and Srilanka. It is available in different sizes. It removes the affliction of Sun. Someone who has afflicted, ill aspected or ill placed sun, shows arrogance, wavering temperament, jealous, over ambitious, irritable, angry, haughty, proud, self opinionated, showy, dominating nature, dangerous tendencies, obstacles and difficulties, waste, extravagance, untrusted. It helps in controlling these illeffects. If there is any loss through the misdirected efforts of females, (when afflicted by Venus), public opposition, unfriendly towards women (when afflicted by Moon) immoral and spiteful, this bead is quite helpful. 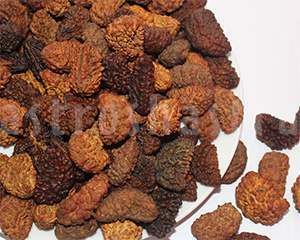 This is the mother of all other forms of Rudraksh. These gives all the worldly pleasures and then helps attain perfection in after life. It is said that where it is worshipped, that place is always full of riches and goddess Lakshmi has special grace on such places. It bestows all prosperity on the devotees. A weak Sun may show lack of self esteem, wavering temperament and jealous nature but too strong Sun badly placed can show too much of ego, over ambitious, self opinionated, showy, dominating nature, and a selfish personality. Diseases signified by Sun are weak eyesight, headache, disturbance of blood circulation, fevers, bone weakness and palpitation of heart . 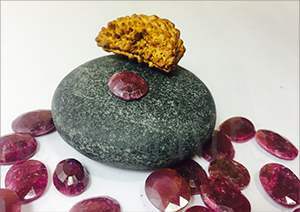 1 mukhi controls the malefic effects of Sun and cure diseases caused by planet Sun. Psychologically the confidence, charisma, leadership qualities and prosperity of the person increase as the Sun is pleased with the wearer. It helps in learning, how to use and relate with power , position and authority in a dharmic way. 1. The possessor of it is blessed with unexpected wealth, and all his desires are fulfilled. 2. It is very effective in the cure of chronic asthma and TB. 3. Beleived to destroy Sins of all Janamas. 4. It helps in attainment of very high level of Spiritual Consciousness and Mental Peace i.e. Attainment of Nirvana. 5. It pacifies the malefic effects of planet SUN. 6. It is said to be very beneficial in curing Headache, Right Eye problems & diseases of Liver, Bowels, Heart Diseases, Bone Pains etc. 7. It is helpful in increasing the power to Concentrate, Increased Confidence, Leadership qualities and Prosperity. 8. It controls Blood Pressure. In the Srimaddevibhagavat, 11th Skand, Chapter V verses 25 and 26 it is stated "According to Jabala instinct for wearing it results only after attaining the perfection of Vedas and blessings of Lord Siva during preceding births". In Chapter VII verse 23 it is stated "Energized beads or infused with Bija mantras should be worn. It helps envisioning the Partattva". In Padma Purana Chapter 57 Translated by Bhatta 1989 it is stated in verse 38 to 39 "The bead of one mouth is virtually Siva, it removes the sin of brahmanacide. Therefore one should wear it for the destruction of all (ones) sins. He would go to Siva's heaven and rejoice with Siva. O Kartikeya a man would obtain a bead of one mouth due to great religious merit and due to Siva's favour and would also obtain Kailasa". In market fake round is found, in which you can notice figures of serpant , conches, trishul, Om , shivling etc. inscribed artifically. Sometimes two mukhi is made into one by removing 1 face so skillfully that only experts can distinguish it. Therefore it must be real and pure in whatever shape it may be. Beware of frauds , who are selling round bead or man made bead. It can be worn in Gold , Silver or Panchdhatu Pendants and chains also along with Ruby Gemstone . Making hole in 1 faced is prohibited. Astroshastra provides various options in pendalling and if you are intereseted in any combination with it , you may contact us at sales@astroshastra.com , we will be glad to help you. It is very effective if worn with Ruby or Surya Yantra, Mahalakshmi , Navgrah Yantra or Shree Yantra silver pendant. It should be worn only after being energized by its mantras. Those who wear 1 faced, the following mantra should be recited 108 times daily with devotion and punctuality. 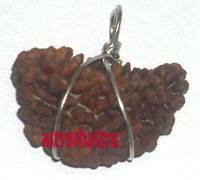 One muki Rudraksh 20 mm approx.